Menu Planning - Are You Making These 3 Mistakes? Menu Planning – Are You Making These 3 Mistakes? The following is a guest post from regular contributor, Emily at So Damn Domestic. Menu planning is a great way to get ready for your week. On grocery day, you’ll have a list of everything you actually need to buy (and nothing you don’t). Each day, you will know exactly what to prepare and cook. If so, you’re probably making at least one of these 3 menu planning mistakes. Mistake #1 – Not having any structure. Some families have a pretty consistent schedule, and they’re able to have a menu plan routine. Maybe it’s pretty specific, and every Friday is make-your-own pizza night, Tuesdays are for tacos, and Saturday is leftover night. Another way to do it is to have Meatless Monday, Fish Friday, Salad Bar Saturday, and other “category” nights. There are a billion recipes out there, but if you know every Friday you’re making a seafood recipe, you’ll have a little bit of guidance when you’re deciding what to do. Your structure might vary from week to week though, especailly if your family’s schedule varies a lot. If that sounds like your family, take a look at your family’s calendar before planning. If you have evening lessons or extracurriculars on Thursday, maybe that’s a good day for a crock pot meal. If you have a big pot luck picnic with your friends on Saturday for lunch, maybe a light dinner of appetizers or a salad will do that evening. If your kids’ school is having a fundraiser at a local restaurant, maybe you want to show your support by planning to eat out that night even though you would normally cook at home. Whatever your structure looks like, having some sort of guiding plan will give you a more narrow place to start, allowing you to focus more quickly. Mistake #2 – Not having recipes at your fingertips. So you’ve decided that every Monday, you’ll make Mexican food. Now what? Do you have some favorite South of the Border not-really-recipes you make “off the cuff” a lot? Write those down in a list so you won’t have to think of them from scratch each time. Names like “taco salad-ish pasta thing Robert likes” will jog your memory, even if it’s not a real recipe. Do you have a collection of cookbooks full of awesome recipes, but feel overwhelmed at looking through them? Maybe you should use color-coded page flags to mark your favorite recipes. Use orange for all of your Mexican Monday recipes, no matter what cookbook they’re in. Use green for Fish Friday, and red for cook-ahead or crockpot meals. Pinterest is also great for this. You can make a pin board for each type of meal you plan to make, or just have a general recipe board. I recommend separating sweet and savory recipes though. Otherwise it’s too easy to get distracted by all of the yummy-looking desserts when you’re meal planning. Whether you make your own family cookbook, a simple list of your favorite meals by descriptive name, bookmark your cookbooks, or take advantage of online tools, making sure you have your favorite recipes (and ones you want to try soon) at your fingertips will make planning so much faster. Mistake #3 – Ignoring your plan. Maybe you plan, but then you pick up random stuff in the store anyway. Don’t. Make a shopping list based on your plan and stick to it. Or you keep “sliding” meals on your plan because you get distracted by a shiny new recipe… until stuff starts to rot in the bottom of your crisper drawers. Don’t. Add those shiny new recipes to your Pinterest boards or bookmark them in your cookbooks with sticky tabs so that you can plan to try them soon. Like actually soon – next week. Not “someday” which never comes. You don’t feel like cooking, so you keep going out to eat or ordering something to be delivered, and pretty soon you realize you don’t have to menu plan for NEXT week because, well, you didn’t actually use this week’s plan at all. Stop that. You’re planning for a reason. If you need to choose simpler recipes that you’ll actually follow through with, do it. If you need to plan a night or two of frozen dinners or eating out, do that. If you want to batch cook some things and freeze the leftovers for another night, go for it. Make the plan work for you. A menu plan is a tool you control. Not something to fight against. So which of these menu planning mistakes are you guilty of? No matter what style of planning you choose to do, a menu plan can be such a helpful tool! Take advantage of that. Find your structure. There are tons of free printables all over the internet, or you can make your own format. 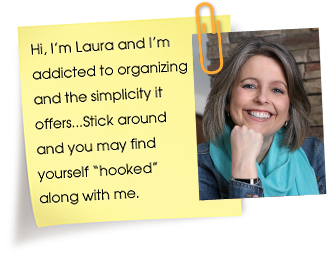 Laura’s printable menu plan is here on OrgJunkie of course. Mine are over on So Damn Domestic – three different menu planning formats for different personality types. Just pick a format to use and try it out. If you don’t like it, you can change it up next week. Curate your recipes. Start organizing your Pinterest boards better so that you can take advantage of that tool. Grab some colorful sticky tabs for your cookbooks the next time you’re at an office supply store or Target, and start making a list of the random stuff you cook without recipes. When you sit down to plan, you’ll have tons of great ideas at your fingertips. Make your plan work for you. When you hit that sweet spot where you’re planning in the best way for your family’s needs, you and your menu plan can waltz into the sunset together. If you feel like you’re just fighting and bickering with your menu plan, take it to therapy with you and implement some changes. Plan for real life. 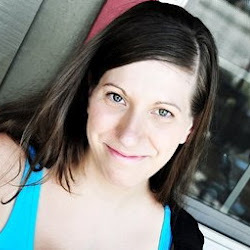 Emily Chapelle is military wife and mama to two little ones. She blogs at So Damn Domestic. Get her free ebook, Finding the Awesome,for more inspiration and guided, broken-down exercises to do more, stress less, ditch guilt, and love your life. 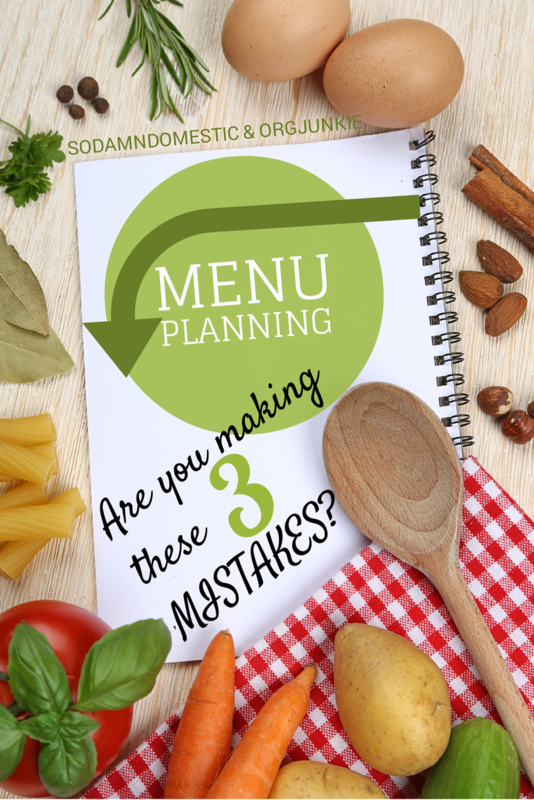 20 Responses to Menu Planning – Are You Making These 3 Mistakes? I use and rotate (depending on my mood and circumstances) a couple different menu planning worksheets. One of them has space for writing down the day’s activities so that I can plan the type of meal accordingly (crockpot that day, etc.). This method is sometimes too structured for my family and when I use this method I tend to plan too many meals so that my frig is overflowing with leftovers. The other one I use simply lists the recipes that I have purchased ingredients for and what category they fall under – main dish, salad, etc. I vary mine depending on what we’re doing too. But starting the week with whichever one you choose does help, I think! I’ve had the overflowing with leftovers thing happen too. Haha! Usually I just send more with my husband for his lunches, and then maybe shift everything one day to have an impromptu leftover night if he can’t keep up. I love your idea of just listing out your entrees and sides, and then being able to mix and match each night depending on your mood. So smart! I don’t have a “structure”. I just plan 6 meals each week and make whatever I feel like making each afternoon,. Sounds like it’s working for you! I do the same thing!!! I like the “theme” night idea and want to add that to my menu plan! What I did do, however, was (from 40 years of collecting recipes, and other’s recipes given to me, plus favorites from our many cookbooks) compile my own cookbook on my Mac. So I can just bring out the computer when I need a recipe. I have many categories for recipes, I’m a splitter, not a lumper, and that helps find recipes as well. I have taught my husband, who does a lot of the cooking, to look at the computer file first, and I may not have to “paste” all these scanned recipes in binders at all (that is my goal, go digital!) As I use a recipe, I add it to the “We’ve cooked…” chart, and as I make a grocery list, I add it to the recipe. For my many recipes, it was too expensive to go online and have a service scan and list the recipes, and too time-consuming for me to type them all in to a service. Did I say I just love my little scanner (?) It’s a stick scanner that can take any size paper up to 8 ½ x 11. I then just copy and paste to a Word document. I did all this during Phoenix’s notorious hot summer this year. I feel pretty smug now! Wait – what’s a splitter and what’s a lumper? It sounds like you’ve really figured out a system that works well for you. That’s so great! Some weeks I’m really bad at following my plan! If I find I haven’t followed my plan at all one week, it’s usually because I forgot to take our calendar into account. Oops! You have some good ideas. Gets me thinking. I don’t cook, at least not very well. So that limits me. My husband cooks, but motivation is our problem at the end of long days. I do have a monthly calendar on the fridge and a master list of meals and I’m really trying to push us to plan it out. We’ll get there eventually. How did you compile your master list? Is it simple stuff you feel comfortable cooking (since you feel like you aren’t a pro in that area)? Or is it more ambitious recipes you hope to someday master? It sounds like SIMPLE recipes will be the best for both you and your husband. Maybe go through that master list of meals and put a green sticker on the easiest and quickest ones. Then add a yellow sticker to the slightly more ambitious or time consuming ones, and purple for the ones that feel like they’d take all day but that you’d still like to try sometime. Then, plan with 4-6 green meals each week, 1-2 yellow meals, and MAYBE one purple meal for you and your husband to attempt together on a weekend day. Kids can be tough sometimes, but outside of issues stemming from an actual sensory processing disorder or something like that, I say stay firm… this is dinner. Hungry? Eat it. Generally we eat similar meals each week but alternate the days, except on Fridays when we grill fish and chips. It really does help to stay organised and spend less at the supermarket! Guilty as charged for number 3. At least until I started grocery shopping online. Far easier, saves time and less temptation to add extra stuff to the cart.